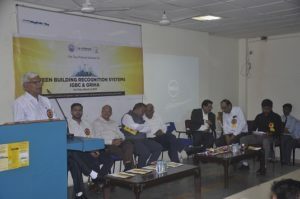 National Seminar on “Green Building Recognition Systems: IGBC and GRIHA” under the ageis of Institution of Engineers (IEI), Indore Local Center. first speaker and Guest of Honor was Mr Jitendra Mehta, Chairman IGBC Indore Center and his topic was “Evolution of new sophisticated technologies in Green Building”. 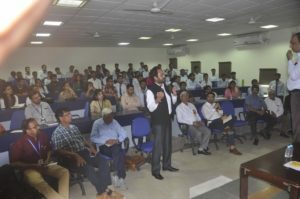 He explained the various methods and technologies that can be sued for the construction of Green Buildings following the norms of IGBC and GRIHA mainly he focused and stressed on follwig on the norms of IGBC as he was the chairman of IGCB Indore Center. The 2nd speaker was Ar. Umang Agrawal, GRASS Consultants, Mumbai and his topic of deliberation was “Hypothesis – Green is not Global”. The speaker focused and compared the scenario between the green energy norms followed and implemented in India and abroad and emphasis that India needs to focus on its needs rather than following the western culture for construction of buildings and infrastructure. The 3rd speaker was Er Jitendra Vyas, Consulting Engineer (Green Building Expert), Indore and the topic was “Energy Efficiency in Green Buildings”. 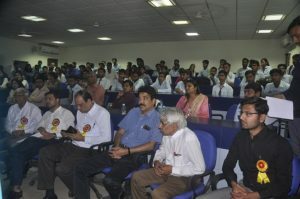 He discussed few case studies in India and abroad where Green building norms were followed. The speaker works with United Nations (UN) and for development of facilities of the third world countries. The 4th speaker was Er. Priyanshu Kumath, Founder & CEO, Clean Water, Sustainable Water Tech. PVt. Ltd. Mumbai and the topic was “Sustainable solution in water treatment”. The speaker explained the concept of floating island and explained the working of Sewage Treatment Plant with the animated video for the reuse of Water for domestic purpose and for gardening. The practical methods and ways in which reuse of water can be done for the restoration of wells was also explained to the audience.